Among Padre Pio’s spiritual children were people from all places and from all walks of life. Gerardo De Caro, an Italian legislator said of Padre Pio to his fellow legislators in the Italian Parliament in 1947, “I tell you that the light of the world is hidden today in the cell of an old friary on the Gargano. . . where there lives a gentle being, who bears in his body the stigmata of St. Francis; he teaches us to listen in the depth of our being to the language of God.” By 1947 the fame of Padre Pio was spreading rapidly and the shrine of Our Lady of Grace was quickly becoming an international place of pilgrimage. It was in the spring of 1947 that Pope John Paul II (Fr. Karol Wojtyla) made a trip to San Giovanni Rotondo to visit Padre Pio. At that time, Padre Pio had already had the stigmata for thirty years. As a newly ordained priest, Fr. Karol Wojtyla was sent from Cracow, Poland to Rome and enrolled at the Angelicum University where he was to complete his post- ordination studies in theology. During his Easter vacation in 1947, twenty-seven year old Fr. 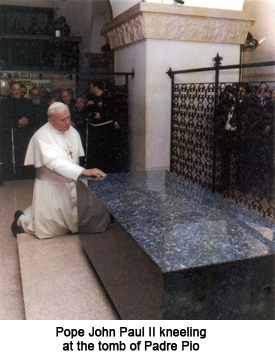 Wojtyla went to San Giovanni Rotondo. He attended Padre Pio’s early morning Mass, recited the Angelus with him at noon, made his confession to Padre Pio, and attended the benediction service in the evening. After Padre Pio had received the second letter he said to Angelo Battisti, “Angelo, save these letters because one day they will become important.” This is an indication that Padre Pio was aware of what lay in the future for Bishop Wojtyla. Today the two letters are safely kept in the archives at San Giovanni Rotondo. On May 23, 1987, he returned a third time to San Giovanni Rotondo, now as Pope John Paul II, to celebrate the one hundredth anniversary of Padre Pio’s birthday. He was the first pope to visit the area in seven centuries. 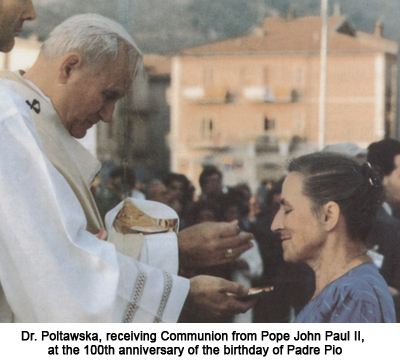 In the huge crowd that attended Mass that day was Wanda Poltawska — grateful to God, grateful to Pope John Paul II, grateful to Padre Pio. “It is my personal conviction that Padre Pio is an extraordinary and holy man. I use the word ‘is’ purposely because it is part of his uniqueness that he is still present in the world. People feel his presence. Many are aware of his intervention in an extraordinary way. To some this may seem impossible, but the lives of the saints are full of unusual events. In 1962, I was to undergo surgery for what was presumed to be a tumorous growth. However, I was told just before surgery that I was healthy and could go home. I was ready to think that what the surgeons had stated, namely that there was a five percent chance that the growth was merely an inflamation, turned out to be the case. I had no idea that two letters in Latin had been written on my behalf to Padre Pio by the Archbishop of Cracow, Karol Wojtyla, the first with a request and the second with thanks. I did not know then of the existence of Padre Pio since information about him already well known elsewhere in the world, had not yet penetrated into Poland, as far as I knew. But even when I learned about the letters, I did not want to reflect on what had happened. It seemed too difficult to comprehend a supernatural intervention. A doctor tends to see natural explanations. Therefore, in some sense I laid this question aside without trying to understand it. However, information concerning Padre Pio and his intervention in people’s lives began to reach me from many sources. And then when Archbishop Karol Wojtyla returned to Cracow, I learned of the exchange of letters and who this Padre Pio is. In 1967, I went to San Giovanni Rotondo. I arrived toward evening, hoping to participate at Holy Mass the next morning. However I was told that there were always huge crowds and that it would be almost impossible to enter and be close to the altar. I was standing in the little square in front of the church when I saw a Capuchin priest coming from a side gate. I approached him and told him that I would love to participate in Padre Pio’s Mass, but I was afraid it would be impossible, that I came from far away Poland and that I might not be able to get another passport to make the trip in the future. He said, “Come to this gate tomorrow at 5 a.m. and I will let you in” and that’s what happened. The next morning he led me through the sacristy and I was able to sit near the altar. I could observe Padre Pio from a short distance. He was an old man at the time and walked very slowly. He celebrated Holy Mass with incredible intensity and with an expression of suffering on his face. It is impossible to find adequate words to describe this Mass. This sacrifice was truly the representation of the Passion of Christ. Even people of deep faith hardly ever can perceive this reality on the altar as a representation of Calvary. Here the reality of His Passion, which is beyond our understanding, seemed to be reflected in the Holy Mass celebrated by this old man. Perspiration from Padre Pio’s forehead ran down his face. The agony of the man was visible. The church, full of people, was silent, unusually silent for Italy, only interrupted now and then by a sob. The Mass lasted a long time, and when it was over, Padre Pio slowly made his way back to the sacristy with short steps. As he was passing by, I happened to be near him. He stopped for a minute, looking around at the people, then looked directly at me. I shall never forget his glance. Smiling, he came even closer to me, patting me on the head, and said, “Adesso, va bene?” (Now, are you all right?) I did not answer. I had no time. But precisely in this moment, I knew he recognized me. I also knew that it wasn’t because of a wrong diagnosis that I had found myself suddenly well several years earlier, but because this monk had come into my life in such an extraordinary way because the Archbishop of Cracow had asked for it. Pope Pius XII, who called Padre Pio “the confessor of Europe” frequently asked Padre Pio for his prayers. In February 1949, the pope asked him to say Mass “for a special intention of mine.” Pope Pius XII also sent a niece and nephew of his to receive their first communion from Padre Pio’s hands rather than his own. Once when Padre Pio learned that Pope Pius XII was ill, he sent a message to him through Professor Enrico Amedi, “Enrico, tell the pope that I am ready to offer my life for him with immense joy.” On another occasion when Professor Amedi asked Padre Pio if he had a message for the pope (this time Pope Paul VI) on his return to Rome, Padre Pio replied, “Tell him that I offer myself as a sacrifice for him and pray continually that the Lord may preserve him for a long time for his Church.” He asked people to pray for the pope “whom I love in my love for Jesus.” Padre Pio would not listen to even the most innocent joke about the pope’s authority or the authority of any superior. Padre Pio’s first prayer in the morning was for the reigning pope. Padre Pellegrino Funicelli, assistant to Padre Pio for many years, recalled how Padre Pio’s alarm would sound at 2 o’clock in the morning as he rose to prepare for Mass by several hours of prayer and meditation. By the side of his bed he kept three pictures St. Michael the Archangel, the Virgin Mary, and the pope. The lamp in his room had to be draped because the light would bother his eyes. Nevertheless, the drape had to be parted so that the first light of day would fall on the pope’s picture. That was how he would begin his day praying for the Holy Father. One of the last acts of Padre Pio’s life was to write a letter to Pope Paul VI in which he said, “I offer you my prayers and my daily sufferings as a small but sincere contribution on the part of the least of your sons, in order that God may comfort you with His grace to follow the straight and painful way in defense of eternal truth, which does not change with the passing of the years.” Eleven days later Padre Pio passed away.